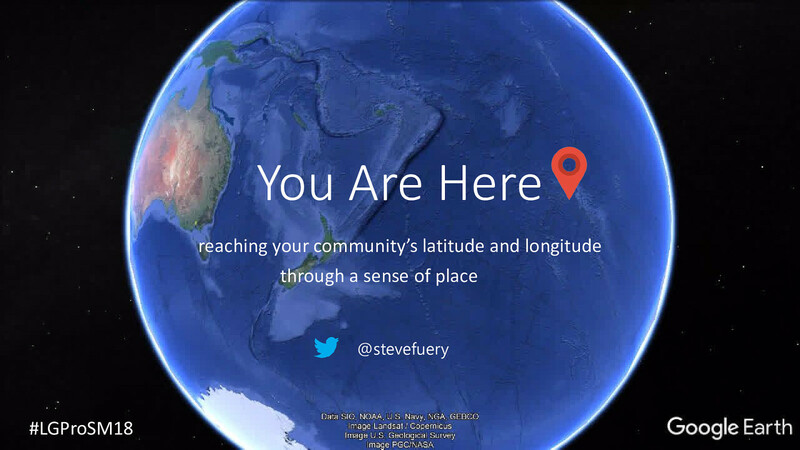 You Are Here reaching your community’s latitude and longitude through a sense of place #LGProSM18 @stevefuery Today I’d like to take you on a journey that will help you understand what makes mapping-based engagement so special and how to do it well. Video of Google Earth zooming in from the frame in Slide 1 to CQ Functions, 113 Queen St Melbourne. So what is it about locating yourself that is so special? You get a hint of this as this clip zooms into where we are today. There are a few things going on in your noodle when you see where you are in relation to your local surroundings. For starters, it’s attention grabbing because it’s more relevant to us personally. We get a sense of this when the weather goes from a national to a local view, and in this example it helps you work out what you should wear today - but it only conveys information in one direction. Of course, two-way information flow raises the possibilities. One example is the Kamo Place Race, a town plan done in two months using weekly agile ‘sprints’. The community asked for more green space, but it turned out that they didn’t know how much they had…what they were missing were the walkable links between them and through the town. Reflecting this information back to the community re-framed their question for a much better outcome. Local government does a lot of community engagement, and design of these engagements is more important than we think. IAP2 principles include informing the community on how their input has influenced decisions – a massive emphasis on ‘closing the loop’. This is the design principle used in the previous example (Kamo) and this one, the Great Bass Coast Shire Council Plan engagement of 2016-17. Double diamond - don't fall for 'solution seduction'! The ‘Double-Diamond’ of design, showing diverging and converging phases. Under-resourced with tight deadlines, temptation to start with the solution, in the second diamond, reaching for familiar tools (and I’m looking at you, SurveyMonkey!) This gem of advice from Leisa Reichelt (ex GOV.UK, ex DTA, now Atlassian): “Fall in love with the problem, research, analyse, then design the whole, including reflection/closing the loop.” Even if we get this right, we are still facing many challenges and here are three big ones. One of our challenges is trust in our brand. The Edelman Trust Barometer for 2018 shows a two-point decline in Australian government (in general, including federal and state). No one turns up each day to do a bad job. Issues heavily scrutinsed in the media (like the definition of ‘Waste Services’ or worse, Centrelink robocalls) hint at good intentions that, for various reasons, aren’t planned out for unintended consequences. Media reporting in these cases can wield emotional contagion as a weapon that is truly destructive when used repeatedly. While we’re on the subject of ‘good intentions’… Trust in social media. These platforms started with good intentions, built by young white guys in Silicon Valley, but when they needed a sustainable business model they focused on capturing our attention and then selling it to the highest bidder. Again, whose job is it to look for unintended consequences? Either by design or deliberate misuse? FB’s stock value plunged $45B (around 9%) recently and now they’re acting. It seems that these companies had a latent ability all along to do something about trolling, about considering how your year in review picture might not be one you want to celebrate. Financial rather than ethical motivation forced their hand. Another challenge is trust in the internet in general. Australian Troy Hunt is an independent consultant for Developer Security, and runs this website from the Gold Coast. The Equifax breach should be in there somewhere too, which left nearly half the American population at risk of identity fraud. It’s more about the reaction time for organisations to notify their customers when a breach occurs and how quickly it’s fixed. In early may we learned of the CBA losing two backup tapes in 2016 with account details of nearly 20 million customers. Now, take out your phones and key in an email address into haveibeenpwned.com and a show of hands as to how many of you will be changing passwords during the lunch break! We also have to face a problem of channel saturation and signal to noise. Latest stats quote 576,000 hours of video are uploaded to YouTube every day! Compare this landscape to when we started out in social media several years ago? How do you connect in this environment? The same is true with consultation fatigue – so coordination of engagement activities is crucial. And don’t forget that some community members are just happy that we’re providing the services and don’t really care to hear from us. There’s a lot more to the experience of life than successfully meeting basic needs and building on them. For a start, we’re not all white north-American upper-middle class educated males who reflect Western values and ideologies. It was a start but… We really are emotional beings. We grasp concepts like beauty, awe and wonder which add to the bonds we have with each other and our environment. BTW - by discussing psychology, I’m not suggesting dark patterns of persuasion. A lot of what we think, feel and how we behave is based in a psychological need to belong and the emotional consequences have been well studied. Connections with other people can become reasons for happiness. Supportive social networks can act as buffers against stress and offer some protection against depression. For students, a sense of belonging to peers and teachers can positively affect academic performance and motivation. For some, belonging and attachment to co-workers is a better motivator than money. Belonging can also contribute to a meaningful life, since being a part of a group translates to being a part of something that's beyond the boundaries of our own self - a sense of community. Mapping is the visual link to that sense of belonging to a place and a community. The personal connection with mapping tools taps into the creative part of our brains. Framework adapted from Dr Elizabeth Sanders’ ‘Say, Do, Make’ model – taken from Melis Senova PhD in ‘This Human – how to be the person designing for other people’ (BIS Publishers, 2017). A new perspective on design thinking. An example of a connection at an emotional level is historypin.com, matching wise old minds, the stories from their youth and shoe boxes of old photos with the younger tech-savvy generation (ie. grandchildren). This photo was supplied by the Phillip Island Historical society and shows the store at the corner of Thompson Avenue and Chapel Street, Cowes, looking north towards Stony Point on the Mornington Peninsula (just visible on the horizon). Historypin allows you to geolocate a photo and superimpose it on to Google Maps StreetView. You can go full-screen adjust the opacity and write a short piece of information to accompany the photo. Mapping for Change works with groups and organisations who want to understand, improve and produce information about the places that matter to them. They offer a range of participatory mapping services to voluntary and community groups, business organisations and government bodies. It’s a wholly owned subsidiary of the University College of London. Just one of their projects. There are around 30,000 Gypsies and Travellers in London. With some of the poorest social outcomes of any group in Britain the burgeoning cuts to public services will have a disproportionate effect on the community. The first step towards transformative social change is for all stakeholders in decision making processes to have comprehensive evidence, to expose inequalities and injustices, to inform policy making and to enable civil society groups to hold authorities accountable on their decisions. These are the tools many of us in Victorian local government are already familiar with. VicRoads’ use of Social Pinpoint to get community feedback on the Bass Highway from Anderson to Leongatha. Note a high number of comments (121) at Kilcunda, worth a closer look. It turns out, this is a pretty notorious area, with an ill-defined service road and no formal pedestrian crossing. While there's truth to the saying "the plural of anecdote isn't data" there's weight to the amount of personal accounts posted around these very topics. When you lay a heatmap of vehicle crash stats over the top of this, it builds a solid argument when VicRoads are making a case for road funding priorities. Here's that spot on a quiet day. The same can be said for the road between Wonthaggi and Inverloch. It's pretty clear that some kind of overtaking lane should be considered. A couple of examples we from Bass Coast. We used CrowdSpot with two projects. This one was run by our Infrastructure Team to help create the Aspirational Pathways Network. And this one was driven by our Sustainable Environment Team, where the community helped create the Biodiversity Biolinks Plan, helping to connect the pockets of remaining vegetation in Bass Coast, of which there's only about 14 per cent left. The point being: you can use these tools for very different projects. These tools also have great back-ends to collate, view and export data in a meaningful format. They have some great reporting tools too. This one shows some surprising results for the City of Melbourne's Draft Bicycle Plan, with 1000 individual spots, 1350 comments, 4500 supports. The important thing to remember with any consultation, is to plan to capture data from everywhere. Running a pop-up tent at a market or festival? Use tablets to allow people to fill it out or fill it out for them. I didn't have a photo of where we've done this, so here's a cheesy animation! Plan to use low-fidelity methods to collect your data too. Not everyone is online or is comfy with filling out a survey on a tablet, so print a map! Use Post-Its! Let them draw on it with markers! Whatever works but plan to use alternative methods too. Another video of a Google Earth flyover of the township of Inverloch, pausing to show each of the six playgrounds. This took me about 15 minutes to put together - experiment with the tools. Seek out one of the many tutorials if you're unsure. So, let's say the Inverloch community were to ask for more playgrounds. We'd do something like this to map out and reflect what's already there. Spark a conversation to help educate and validate that what's being requested is what's needed. Like in the Kamo example, the better informed everyone is, the better the outcome. Three things: remember that mapping tools are powerful because they connect on a deeper level; irrespective of what tool you use, if your consultation is well designed you'll get valuable, accurate information to inform decisions; and play with the tools, get familiar, watch some tutorials. You don't need to spend tens of thousands of dollars to try these things out. Start with Google Earth Pro - it's free and well supported. View You Are Here! on Notist. Asking people to place themselves on a map is a powerful way to connect. We can tap into local knowledge and unique insights through map-based engagement. It’s personal. Come and see how you can reach your community’s latitude and longitude through a sense of place. "OK everyone, take out your phones & key your emails into https://t.co/Lq8s2EHid1"
I had some fun talking about trust challenges for govt, social media & the internet in general at #LGProSM18. Password resets for lunch anyone?